Regular readers of this Not A Blog know what a huge fan of his work I am. No, he did not write science fiction or fantasy... but (surprise!) despite my love for our genre, I read a lot of stuff outside of it. And once I had sampled Pat Conroy, I read every book of his eagerly as soon as it came out. THE PRINCE OF TIDES is probably his masterpiece, but I loved BEACH MUSIC and THE LORDS OF DISCIPLINE and THE GREAT SANTINI and THE WATER IS WIDE as well. Oh, and his non-fiction memoir, MY LOSING SEASON, another engrossing read. The movies based on his books were pretty damned good as well, even if the film version of THE PRINCE OF TIDES did omit... well... the prince of tides. SANTINI is the best of those. Amazing performance by Robert Duvall, once of the best of his career. 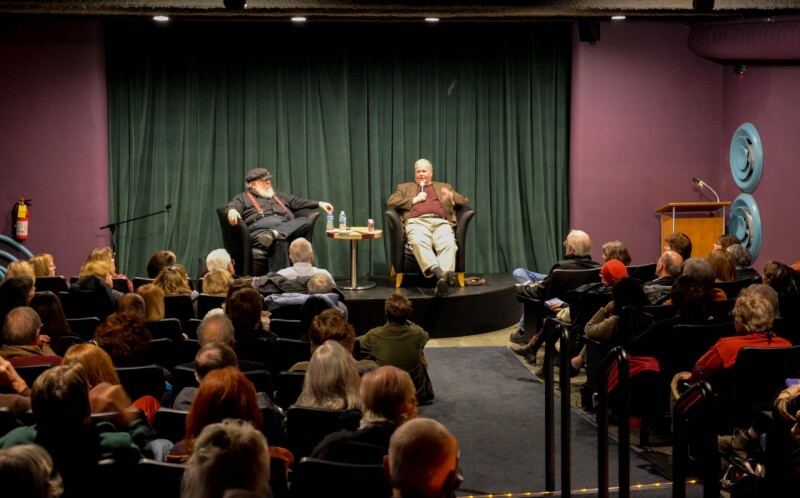 A couple of years ago, I had the honor of meeting Pat, and hosting him for an author event and booksigning at the Jean Cocteau Cinema. It was a rare privilege, and one I will always remember, and I can't tell you how thrilled I was to learn that he'd read and enjoyed my own books. Pat passed away in March... but his books will live on, and so will his memory. A worthy project, I think. I'll be donating. I urge all of you who love good writing to do the same. I smile at your mood, thinking it must be catching. Of course, I've been reading Twitter, so I asked for it. An ex of mine, who was a decent writer of songs, was of the opinion you couldn't write anything worthwhile, even something light & happy, unless you were feeling a little melancholy, so, who knows, it might not be all bad at that. Personally, I sort of feel that bookish people tend to stay up late into the night and think too much -guilty as charged! The books live on and so do good memories and legacy. As a librarian and a reader I find this project awesome and inspiring. I hope it does come to life. A master at selling the drama! I would be thrilled, like many, to see your interview with Pat Conroy. Did you happen to have a broadcast version of it? However, we are presently looking into ways and means to record and possibly stream future author events at the JCC. GRRM, You made my local rag (not the first time). The picture of you and S.King might get pinned to my cubby wall for a stint. I'll be watching the interwebs for the interview. I understand that you interviewed Stephen King recently. > books in that time!" After hearing the lines above, the smallfolk have been severely depressed on multiple online communities. I hope you were joking with that "6 months 3 chapters" remark. If it please you m'lord, we'd love it very much to be told that it was a joke. Of course it was a joke. Hyperbole. Stephen King writes much faster than I do... but does anyone really believe he turns out a book every time I write a chapter? By that measure, he would have written 72 novels in the time I took to write GAME OF THRONES. Sometimes I cannot believe the idiocy of the internet. It pleases me to inform you that the spirits of the people have been lifted after your clarification. Many of them express their sympathies, that you cannot even make a joke publicly, without having to explain it later. At the same time, others implore you to improve your taste in jokes. Maybe one day... but I am booked up fully for 2016 and 2017, and even have a few things scheduled for 2018. I am not adding any new events at this time. Do your planned events in 2016 and 2017 including coming Down Under? We all love you here. I am huge fan of Pat Conroy as well. The Lords of Discipline is one of my all time favourite books. I actually wanted to go to Military college because of it. RIP Pat Conroy. This is very odd. I had a dream last night that I met both of you, and now I read this news through you today (maybe I'm a greenseer). Thanks for telling us about this Mr. Martin. I'll have to donate. You are co-writing something? I would like to see this. And when you will come to Brazil to talk with us? I recently played the Telltale Game of Thrones game. I know that House Forrester exists in your books, so I just wanted to clarify: Is the information that we get about them and the Whitehills (their seats, their sigils and their words) valid, or is it only canon within the tv series universe? Only the books are canon.